In an attractive central residential area, we are six blocks from UT-Austin, 2 miles from the Capitol, and conveniently located near LBJ Library, downtown, Town Lake and Lake Austin, hike and bike trails, and most Austin attractions. 5 guest facilities. Singles $70-129, doubles $84-139. Extra guests $15. Visa, Discover, and Master Card accepted. TDD available. Owner/hosts live on property, All rooms and suites have private baths, private porches, kitchens or mini-kitchens, private phones w/ answering machines, color TVs, (some VCRs) irons and ironing boards, lighted magnifying mirrors, built-in hair dryers, and sitting and work areas. Full breakfast daily in dining room or a full breakfast tray. 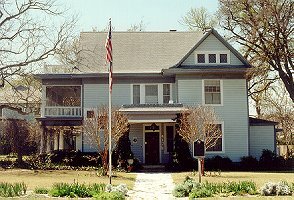 The Bed and Breakfast has a Texas Historic Marker, Austin Landmark, a Heritage Society preservation award, and a listing in the National Register of Historic Places. We are recommended by more than 45 books and internet directories. Children 12+ welcomed. No pets or inside smoking. Minimum stay often required on weekends or special events. This and other Austin Bed and Breakfast Inns can be found here in The Register.